Bar Cavities: 6 Bar Depth: 0.75"
COMMENTS: This mold is great for making guest size soaps. The mold is sturdy. I used it with CP soap and it was very easy to unmold. I can tell this mold will last me for many more batches of soap making! COMMENTS: I use these molds for my Sinus Shower Steamers. As they are shaped differently than my normal shower steamers, it allows me to clearly communicate to my customers that steamers in this particular shape are for "Showers Only" (my other steamers can double as bath fizzies). I find that my steamers in this mold are easier to pop-out than the circular shaped molds. I LOVE these! COMMENTS: These are the perfect size for doing small test batches. Easy release for both glycerin and cold process. COMMENTS: We have three of these at our shop and we are looking to buy several more. COMMENTS: Very nice and easy to use mold. Actual bars are slightly smaller than described. Worked well for a large custom order. COMMENTS: I LOVE this cute little mold. It's a perfect size for guest and sample soaps. COMMENTS: Great little mold for left over soap. Dont have to waste any and the pieces can be used for samples.,the mold has an easy release. 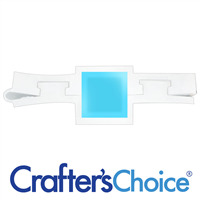 "Square Guest Silicone Mold 1609 "
COMMENTS: This mold makes the perfect sized lotion bars. Holds up well and releases perfectly... love them. COMMENTS: I recently used square soap mold for CP soap. The soap was a breeze to release and I love the petite size of each soap. I will be using them to hand out as samples. "Love These Molds for Guest Soaps"
COMMENTS: These are the perfect size for guest soaps! I just make mini-version of my full-sized bars with leftover MP, and customers love the little guest soaps! 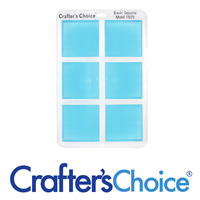 "durable and easy to unmold soaps from"
COMMENTS: i love the crafters choice molds and this one is no different. my soaps come out easily with a nice shine to them. great product! COMMENTS: I would buy this again. Makes a nice small bar of soap. COMMENTS: This is a great mold, makes clean perfect guest size soaps and kid soaps. I wish they had this in more sizes. COMMENTS: I use these for left over soap batter and then sell them as samples. I also plan to use them to make chocolate and vanilla soap sandwiches. I already had 1, but really wanted another one. Some people prefer this size to sit next to the sink. COMMENTS: Works well and is the perfect sample/guest size soap. COMMENTS: I have found this mold great for multiple uses. I use it for guest soaps and also soap scrubs that I cut into cute little cubes. I have used it many many times and it has proven to be very durable. I am actually ordering another one right now so I can have two going at the same time. COMMENTS: I like this mold. I've used it many times and it is still in good shape. COMMENTS: I love these silicone molds. The MP soaps come out smooth and pretty. Works great when using embedded paper. COMMENTS: First off Im a fan of anything silicone and this mold was exactly what I was looking for. Very sturdy, washes easily and is perfect cavity size. • Can be manhandled and holds up well. COMMENTS: Love these silicone molds. Perfect size and so easy to use. COMMENTS: Need to buy more. Love mold. COMMENTS: This is perfect to make samples and test out new recipes. COMMENTS: I purchased the larger size of this mold as well and I love them both. I really like the shape of the bars and how sharp the edges are. If you purchase this mold, you will love it too! COMMENTS: Whenever I make soap, I always make extra to give out as samples. This is a great size, and I have people asking to buy that size a lot. The soap comes out of the mold beautiful, with nice sharp corners.